Vox V-283 Spyder IV Model Hollow Body Electric Bass Guitar (1968), made in Recanati, Italy, serial # 402439, sunburst polyester finish, laminated maple body and neck, rosewood fingerboard, original black tolex hard shell case. 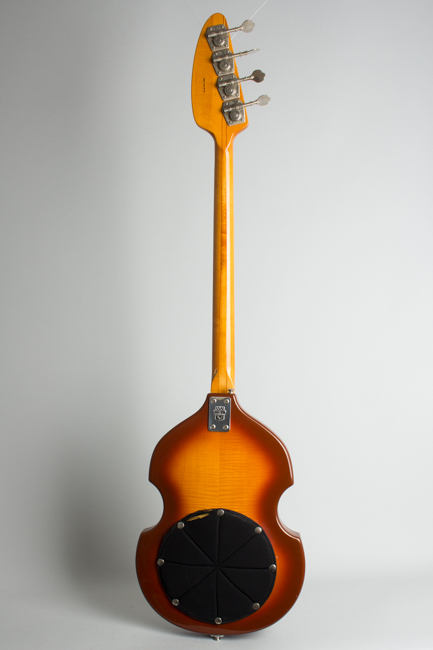 The colorfully named violin-body Vox V-283 Spyder IV was one of the company's final bass designs, a direct descendant of the more prosaically named 1966 V-250 "Violin Bass". The "Spyder" and its sister instrument the Astro IV were built with the same arched, f-hole hollow body, but used the very narrow neck that Rolling Stone Bill Wyman requested for his namesake teardrop-body model in 1966. 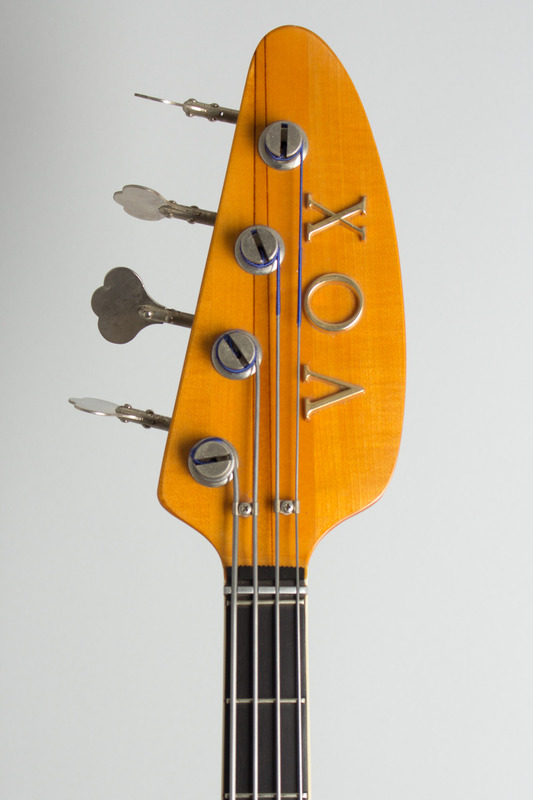 All Vox basses in the 1968 line used this neck design, which is about the slimmest ever fitted to a professional class bass! 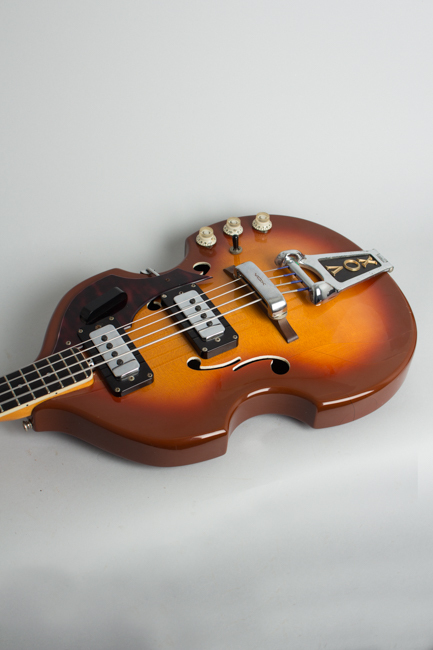 The Spyder IV is in general a pretty far-out take on the Hofner-inspired violin bass that was nearly ubiquitous in the 1960s. It has the typical evolved Vox appointments for 1968: two of the wider-cased metal-covered "Ferro-Sonic" pickups (with more output than the earlier designs) and a *very* large headstock with long-stemmed tuners and a giant VOX logo made of individual gold plastic letters. 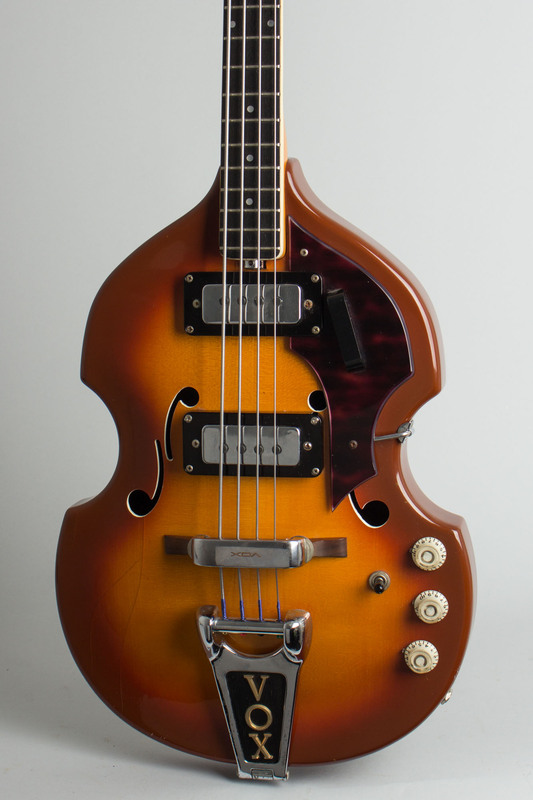 The somewhat muddy orangey-brown sunburst finish on this body was the standard finish option. The electronics are straightforward with a 3-way switch, single volume, and two tone controls. 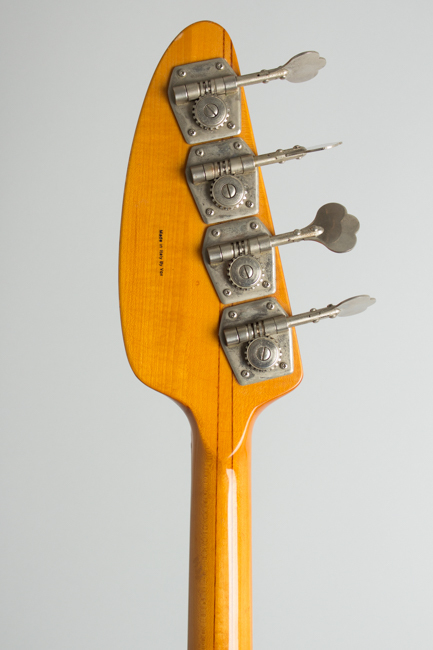 The large chrome tailpiece with a gold VOX logo and the adjustable bridge were standard fittings on the entire line; the slightly lopsided pickguard with a large plastic fingerrest is specific to this model. 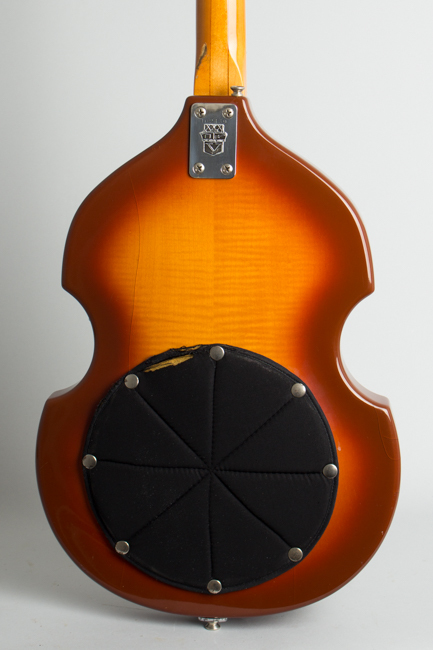 The Spyder IV was the more basic of a set of violin-body basses; its sister model the Astro IV mounted a bevy of the elaborate onboard transistorized effects pioneered by the company in this period. Otherwise they are exactly the same instrument, although oddly this less expensive version seems to be the rarer one today. These third generation 1967-68 Eko-made models are some of the nicest of all Vox instruments in terms of build quality and fretwork, and this is a fast-playing and good-sounding, if rather eccentrically styled, bass from the company's final 1960s line. A distinctive instrument by any standard, this model remains an oddball Vox classic, perhaps, but one with a pedigree! Overall length is 47 3/4 in. (121.3 cm. ), 13 1/4 in. (33.7 cm.) wide at lower bout, and 1 7/8 in. (4.8 cm.) in depth, measured at side of rim. Scale length is 29 1/2 in. (749 mm.). Width of nut is 1 7/16 in. (36 mm.). 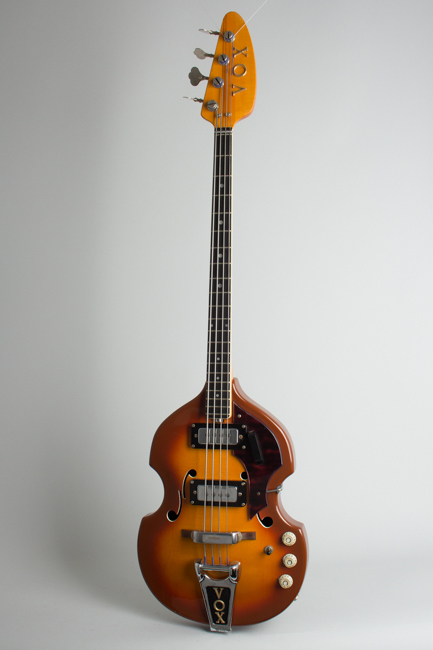 This is an all original, relatively clean bass overall with some typical checking lines to the heavy polyester finish and some general scuffing, dings, and dents. There is one deep dig into the wood on the back of the neck heel, the result of the bass rubbing against the stud of the neck rest in the case. The area between the end of the neck and the pickup ring on the top has a small crack, which is pretty much ubiquitous on these. The knobs are all missing a metal cap insert, which is not noticeable unless you know they were once there. Other than these flaws, the bass shows only moderate use, the frets show very little wear and the neck has none of the common lamination or fingerboard cracks often found on these Eko/Vox creations. Even the oft-missing Vox-branded snap-on bridge cover is still intact. An excellent-playing and sounding example of this unmistakable Vox bass creation, complete in its original large rectangular case. Excellent Condition.